Love these strings. Bought low tension because I was told that these strings run a little more taught than most low tension strings. Trebles sound great, bases sound great and the trebles are 'blue'. I would and will buy them again. these strings are beautiful; I have them on a 1949 di Giorgio hand-made by Romeo himself, and they're perfect. they're tuned down to a b below e, and hold pitch beautifully and still ring. Great service. Early delivery. Highly recommended. I have used all the top brands - they are good but the Dogals are the BEST!!! A great resonance and tone from the low tension are exactly what my Alhambra needed. Medium tension on my Kamouraska sound spectacular!! 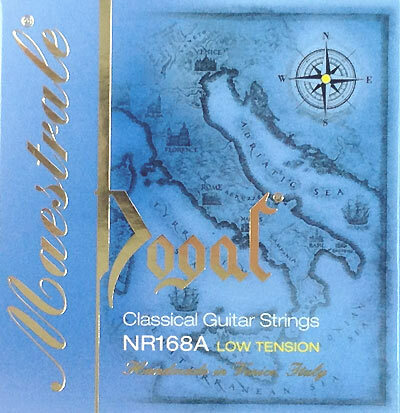 I'm completely satisfied with the Dogal Maestrale strings. I expect to use them in the future.